According to the 2014 American Camper Report from The Coleman Company, 40.1 million Americans over the age of 6 camped in 2013, spending an average of nearly 15 days a year camping. 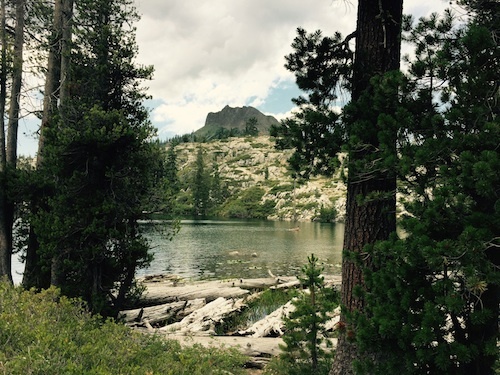 Camping is an American tradition and a great way for people to reconnect with nature, escape the grind and spend time with family and friends. Whether you’re camping in a tent, RV, cabin, or yurt, having all the right equipment for making meals on the road is essential. From coffee and tea in the morning to hydration in the afternoon, and a little wine in the evening, HIC is ready to serve up beverages for camping needs. Primula’s Coffee Brew Buddy saved the morning. 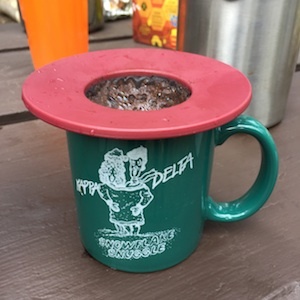 Single cup brewing is a great way to brew at the campsite, and this filter is small, simple and portable, allowing us to create a great tasting cup of coffee The Coffee Brew Buddy from Primula is the ultimate convenient brewing device for an effortless and great tasting cup of coffee; just pour, brew, and drink! 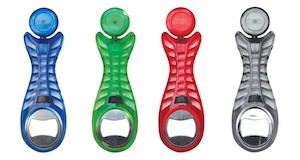 Never lose your bottle opener while camping when using the Shrokie Rewind Bottle Opener. Simply stick the button with adhesive backing to any smooth, flat surface to keep it conveniently nearby. Pull to expand the cord for use up to 3 feet, and it automatically retracts back to where it started for compact and easy storage. Wine2Go is a fold-able, reusable and disposable container that allows you to take your favorite drink on the go. With a wide mouth for easy pouring, the fold-able wine bottle goes from campsite to the trail, and to the beach picnic. 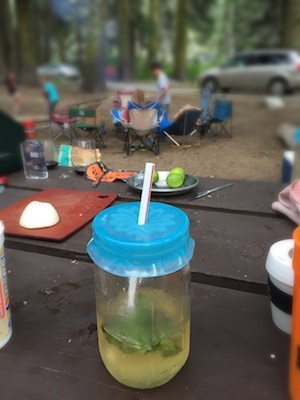 Spill-free sipping at the campsite. The Sipping uCap (Cap-n-Sip) creates a watertight seal around the edges of a mason jar, leaving a small hole in the lid for a drinking straw. 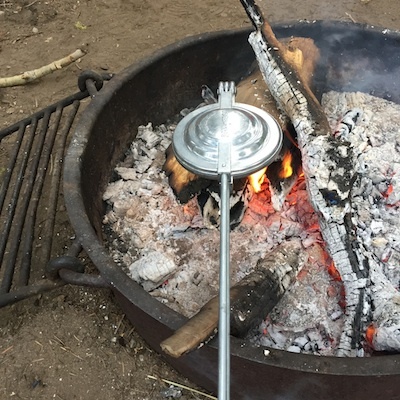 The Essential Collapsible Colander is perfect for car camping. 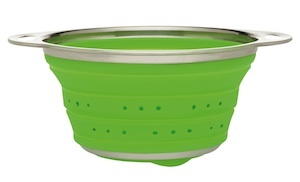 Made from FDA-approved heat resistant silicone with 18/8 stainless steel handles, the colander collapses to 1” for convenient storage – which is essential for camping! On the road, keep food fresh longer with FreshTape. It resealed our bags of chips every time the kids went back for more. We also used it for our cereal, and cheese. 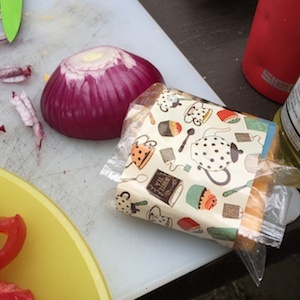 And, because it’s resealable up to 12 times, it kept our food fresh throughout the camping trip. Also great for keeping our food closed between meals was The World’s Greatest Stretch ‘N Twist Silicone Bag Ties. Colorful and easy to use, we found the kids clamoring to help close up the bags of food at meals end. Rounding out our meal, we made mini pies for dessert using our Toast-Tite. Need I say it? Yes, everyone was fighting for the chance to create their own dessert using the Toas-Tite! Our camping favorite were Sweet S’mores. Making Sweet S’mores with Toas-Tite. HIC has a wide assortment of camping-ready tools that help make preparing, eating, and storing food while camping more convenient, delicious, and most of all, fun! This entry was posted in Useful Tools and tagged camping, coffee, Freshtape, Primula, Shrockie, Toas-Tite, U-cap, Wine2Go on July 9, 2015 by HIC, Harold Import Co..